If you like nature and horses, join Suryalila Yoga Retreat Centre for this short break for all levels. Morning yoga classes, three vegetarian meals, and a refreshing salt water pool make sure that you will have time to relax on your holiday. Our daily 1 to 2,5-hour riding trips will lead you through the amazing rolling hills of the Andalusian countryside. We will have separate riding groups for more advanced riders and more beginners, so please let us know shortly your experience, and also height and weight to find a matching horse. Yoga Retreat Centre is a little different than a regular hotel. We have three rooms (our double deluxe rooms), which have their own bathrooms. The rest of our rooms are laid out Spanish farmhouse style and share bathrooms. The bathrooms are luxurious, usually with tubs, and are typically shared with two or three other guests. During this retreat, you will enjoy daily horse trails in the stunning landscape of rural Andalusia, daily yoga classes and delicious vegetarian full board meals in the yoga hotel with view on the horses, olive trees, and rolling hills. Discover the surprising variety of nature around with our friendly Andalusian part bred horses. The rides will lead you through endless sunflower fields, to an old Armitage, and under ancient oak trees. The horses are about 1.55 meters tall and riders need to weigh less than 85 kilograms. We will have separate riding group for beginners and more advanced riders, and helmets can be provided. 1 to 2.5 hours Horse riding trips late morning, afternoon or evening depending on temperatures and group. 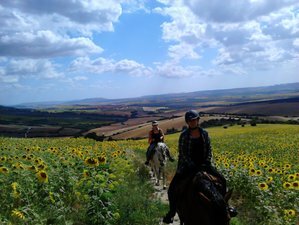 The rides will lead us for example through endless sunflower fields, to an old ermitage, and through ancient olive groves and oak trees. Vidya Jacqueline Heisel, an E-RYT 500 and SYT, is the director of Suryalila Retreat Centre and the director of Frog Lotus Yoga International yoga teacher training programs. Vidya grew up in England and lived in India, Bali, and the USA, before arriving in southern Spain in 2011. Yoga has been Vidya’s life-long passion. She started studying, practicing, and teaching yoga in 1975 and since then, she has taught yoga extensively worldwide. Conny Muennemann, who keeps her eight beautiful horses on the Suryalila Retreat Centre property, has been riding and leading treks through Andalucía for over ten years. By riding with Conny you will see the real Andalucía, which most tourists miss. Suryalila Yoga Retreat Centre is located right in the heart of Andalucia and is surrounded by lovely rolling fields, lakes, and scenic white villages. We are ideally located to explore the stunning nature, fascinating culture and historic monuments of Andalucia. At Suryalila Retreat Centre, we pride ourselves on our outstanding vegetarian fare. Meals are delicious, diverse, and beautifully presented, using all organic and mostly local ingredients. We produce our own olives and olive oil, as well as, many of our own fruits and veggies. Everything we grow is organic - no chemicals or fertilizers are used. We have many fruit trees including figs, peaches, pears, apricots, pomegranates, apples, and grapes. In the cooler months, we like to grow plenty of greens, including kale and different varieties of cabbage and lettuce. In summer we have an abundance of heritage tomatoes. Our organic free-range eggs come from our own happy chickens. Since we are vegetarian, our birds have long and happy lives! Our prices include full board buffets - we do not have room service or an a la carte menu. During your free time you can visit the historical cities of Arcos de la Frontera, Sevilla, Cordoba, Jerez de la Frontera, Ronda, Cadiz, Veher de la Frontera, Tarifa, and Malaga. You can also visit stunning and empty beaches on the Costa de la Luz, stretching from Cadiz to Tarifa, and can be reached by car in 90 minutes from Suryalila. Only 30 minutes away is located the beautiful mountain town of Grazelema, which has the highest rainfall in Spain. Amazing walks, trekking, canyoning, and kayaking can also be found in this area. Durin this retreat, you may enjoy massage services at Suryalila Yoga Retreat Centre for an additional cost. The price for the massages is 65 EUR for 60 minutes or 90 EUR for 90 minutes. You may book your massage at the reception desk after meals. The type of massage therapy available will vary, depending on the therapist currently in residence. In the past, they have offered Swedish massage, deep tissue massage, Thai yoga massage, and Ayurvedic massage. Take the A4 towards Jerez for a couple of kilometers and then follow the N348 towards Arcos de la Frontera for about three kilometers. Take the exit to follow the A382 for about 35 kilometers all the way to Villamartin. Turn right off the short slip road after the exit. The slip road is short and comes up on you quickly. Follow this road for about five kilometers going straight until the four-way stop. At the four-way stop, go straight ahead along the dirt road. There is a sign posted La Granja. Carry on along the dirt road for about three kilometers until you see a sign on your left for Suryalila. If you miss the turn into La Fabrica, the next sign you will see on the left will be for La Granja. Turn around and come back down the hill. At the second roundabout, follow the signs for A4 to Cordoba going all the way around the roundabout and keeping right. Follow the A4 until kilometer 526 (the roads in Spain have markers at each kilometer and the junction number is the kilometer number you are along the road) and take the exit onto the SE40. Come off the SE40 at kilometer 13 onto the A376 towards Utrera, this slip road has two exits; the first one is towards Utrera. After eight kilometers, take the ramp for A373 signposted Prado del Rey, El Bosque, Ubrique, and Villamartn. At the roundabout, go left (last exit) onto the A373 towards Prado del Rey. After five kilometers, take the right turn onto the CA 6105 signposted to Arcos de la Frontera. After two and a half kilometers, near kilometer 13, turn left and you will see a small Suryalila sign. This takes you off the tarmac so drive carefully. After approximately five kilometers, the driveway for Suryalila is on the left (again there is a small sign). Follow the driveway and you will see the gate and flags. Come up the drive and as you get to the paving the car park is on the right. Follow the coast road (E15 /AP7) south past Benalmadena, Fuengirola, and Marbella. After a couple of miles on the road to Villamartin, you will see a left turn with a sign posted Arcos de la Frontera. It is at the bottom of a long steep hill if you are coming from Prado del Rey. Take this left and follow the road for about two or three miles until you come to a crossroads. After about two miles on the dirt road, you will see a sign post on your left for Suryalila. Airport (AGP) (180 kilometers). From there, Suryalila Yoga Retreat Centre can arrange a taxi or you can take the public buses to the nearest by village Villamartin, from where you will need a pickup. Please note that the last buses often leave already in the afternoon, so are not available for late flights. When you are in doubt, just ask us! From Seville, the city center can be easily reached by bus. Buses between the airport and the city center run every 30 minutes between 06:15 and 23:00. The journey takes between 20 to 30 minutes and a single ticket costs approximately 3 EUR. From Seville city center bus station, you can catch a bus to Villamartin. From Jerez, you can also take a bus to Villamartin from the Jerez central bus station. There is a bus that leaves from Malaga bus station directly to Villamartin. The price of a one-way ticket is about 15 EUR. Villamartin is about 15 minutes from the retreat centre. Suryalila Retreat Centre can pick you up from there, so please do inform them if a pickup is needed. A taxi can be arranged to be pick you up and bring you to Suryalila from Jerez Airport (XRY) for an additional cost. Suryalila Yoga Retreat Centre in Southern Spain hosts large yoga retreats and welcomes small informal groups and individual travelers.